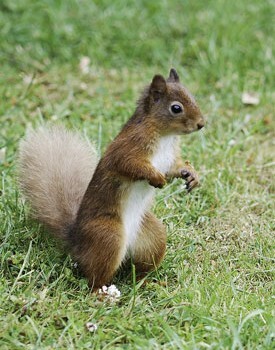 The Squirrel Pox Virus is usually fatal to red squirrels. Grey squirrels are carriers of the infection and can spread the disease to red squirrels. Greys have developed immunity to the disease having been exposed to the virus for many years. In sharp contrast, the mortality rate for untreated infected red squirrels in the wild appears to be 100%, most dying within 15 days of being infected. If caught early enough a vet may be able to treat the squirrel but success is rare. The virus can spread through contact with the infected lesions or contaminated crusts. Most pox viruses are highly resistant to drying, which allows crusts to remain infectious for long periods of time. It is believed that the virus can be transferred by contaminated feeders, which is why red squirrel preservation organisations often recommend that feeders are disinfected daily. Traps and equipment used for catching greys in areas also occupied by red squirrels should also be disinfected. 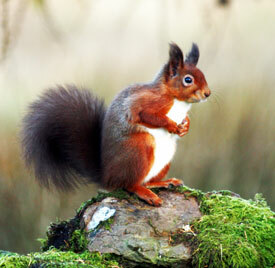 In red squirrels, the virus causes skin ulcers, lesions, and scabs. It can also cause swelling and discharge (from the lesions/scabs) near the eyes, mouth, feet, and genitalia. Additionally, squirrels that fall victim to the disease often become increasingly lethargic as it progresses. Infected animals are said to resemble rabbits with myxomatosis, in that they are sometimes found shivering and lethargic. Death normally follows and is a long and painful experience. The origins of the squirrel pox virus are mostly unknown. The first confirmed incident was in East Anglia in the 1980s. It has since spread to Lancashire (confirmed in 1995-1996), Cumbria (spring 1998), Durham (1999), and Northumberland (1999). 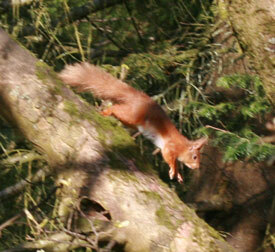 The squirrel pox virus is regarded as a significant factor in the decline of red squirrel populations in the UK. 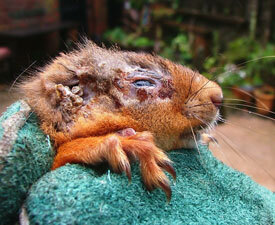 The Red Squirrels Northern England website>> has further information on Squirrel Pox Virus. If you find a sickly red squirrel or a dead red squirrel (which does not have obvious signs of injury like road kill), please get in touch with us urgently on our HOTLINE number: 07878 061880. If no reply, please leave a message.